i KADA Contemporary Dance Company presents the 5th Annual KoDaFe in NYC. This years' theme is "Creating a Peaceful World". We have asked our choreographers to create pieces with us in accordance to this theme. With this show, we hope to inspire others to make better, positive decisions that will benefit not only themselves but those around them. In doing so, one by one, this world can and will become a peaceful and safe place for all to live. KoDaFe in NYC brings different dance companies together to share a stage, making this a vital part of our cultural exchange mission. Through this mission, we hope to nurture the connections and relationships made during this experience, with as many artists as possible. The company name "KADA" stands for Korean American Dance Association. We are a contemporary dance company focusing on cultural exchange through the arts. 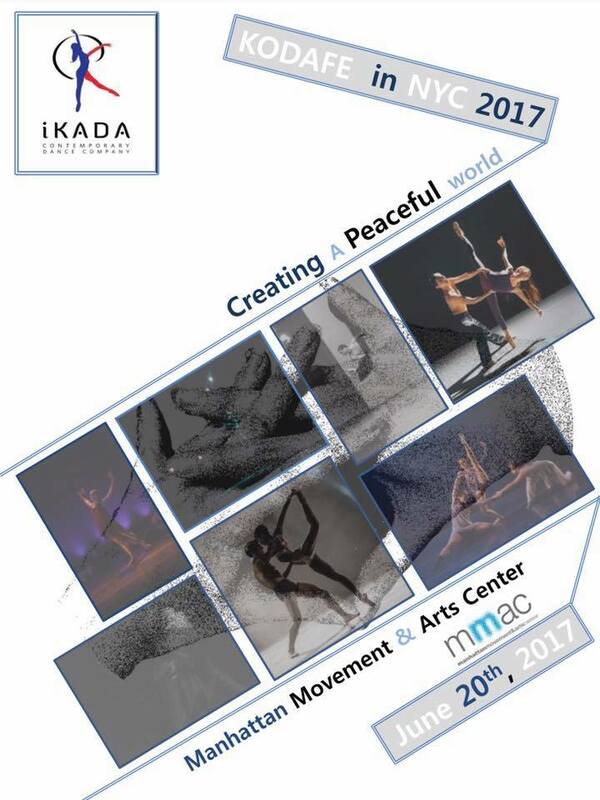 i KADA has been producing contemporary dance shows since 2011 and has succesfully presented an international festival called KoDaFe in NYC since 2013. We have been interviewed by Asian Culture complex, one of the biggest cultural events publications in Asia. For more information, please visit www.ikadadance.com.